Eczema is a complex skin condition involves sores and itches. Leaving the situation without proper treatment will lead to asthma and other complex problems. Effective steps taken to improve the immunity levels will help in keeping the problem under control. Eczema or Atopic Dermatitis is caused by skin inflammation making the skin to appear red and dry with itchy at times. The common areas where the probability of eczema will be more are elbows, wrists, groin, knees, face and neck. People suffering from eczema are highly prone to serious allergic conditions like asthma as well. Taking proper treatment in time with the help of an experienced health specialist will help in overcoming the problems of eczema with complete ease. Leaving eczema without proper treatment might leave the skin condition scaly and rough. Perhaps, it has been identified that the problem occurs because of genetic disorders. 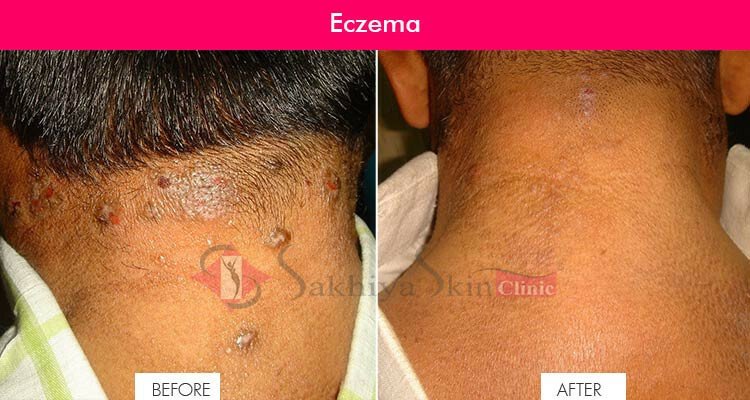 Find effective Eczema Treatment in Mumbai at Sakhiya Skin Clinic. 1. Wash using mild soap or moisturizer. 2. Syndets could be purchased from leading medical counters to ensure that the problem could be effectively taken care. Taking regular baths by bleaching the water mildly is another smart solution that you might consider from a serious perspective. 3. Reduce stress by changing lifestyle. Thinking about issues in life deeply will lead to a lot of psychological stress. Also, physical stress occurs because of overworking yourself. Avoid such problematic situations by reducing stress through regular exercising. Avail the best Skin Allergy Treatment in Mumbai at Sakhiya Clinic. Avoiding tough skin condition is possible when the treatment has been obtained in a perfect manner. In fact, it is necessary to identify the actual causes of infantile eczema so that you realize the optimum results in an eventual manner that you consider. Early treatment options for eczema could be identified with the consideration of major causes and obtaining suitable treatment in a timely fashion.